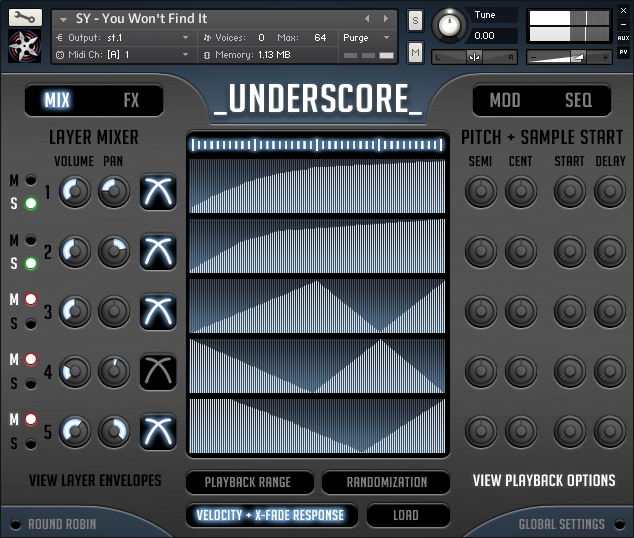 Underscore is a sample library designed for writing underscore music for film, TV & video games. It’s a rhythmic juggernaut jam packed with features perfect for filling in gaps, creating beds under dialogue or to propel a track without using percussion. It offers a wide range of acoustic-hybrid and electronic sounds and is the perfect tool for adding pulsing basslines, complicated polyphonic arpeggios and general sonic candy to your tracks! 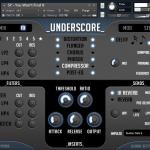 Great for underscore, electronic music and so much more! What The Hell Is Underscore? 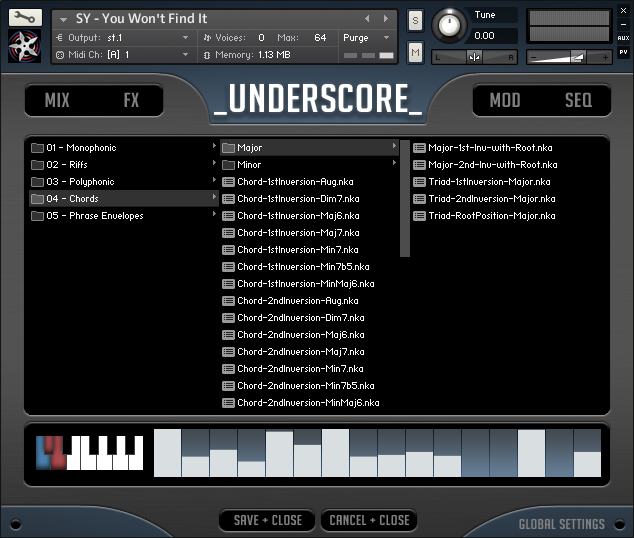 Underscore is a sample library developed specifically for composers who write underscore music for film/TV/video games. It can be used for writing tracks entirely from scratch, and is also the perfect tool for “dressing” compositions or adding some “sonic candy” to them. It provides a huge range of rhythmic pulsing synths with up to 5 independent layers, in a variety of tones and styles that can be used for soft emotional scenes, or for big cinematic tracks. It’s not just for underscore music though – it’s also perfect for hybrid cinematic music, trailer music and a wide range of EDM styles. Listen to the video now…seriously…click on the video! New Percussion and Guitar patches! Built to be flexible, and to adapt to whatever context is required, the sound of Underscore can vary from subtle to huge and everything in between. From rich sparkling arpeggios to soft modulating pulses, bright sweeping plucks to dark evolving soundscapes with multiple layers, Underscore is a rhythmic pulsing monster! The sounds in the library organically evolve with numerous randomization and tonal control options and work equally well under intimate dialogue scenes as they do in electronic dance music or even retro steam punk scores – think Tron or Blade Runner. 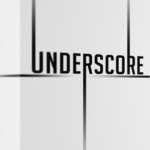 Underscore’s sound spans an array of sonic textures from delicate mallets and plucks to driving guitars and aggressive synths and is filled with “character” sounds for parts that can sit high or low in your mix. 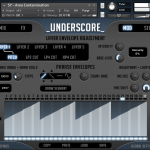 The 200+ presets in Underscore are categorized into 5 groups: Bells & Mallets, Guitars & Plucks, Synths, Percussion, FX plus the Fast Food Orchestra; a collection of hybrid-synthetic orchestral instruments. The power of Underscore also makes it easy to import your own samples and start cooking in seconds. Using the extensive modulation routing, you can push the filters from a murmur to a scream, or turn a juicy distorted saw-wave into a warm mellow aura. Add layers of FX, assign envelopes and Flex Modulators, program custom polyphonic phrases and trigger them live! Why not download the free Shortnoise sample library and import some of the 6GB of samples into Underscore to make entirely new patches!? Watch the videos for more information on just how easy it is to import samples. 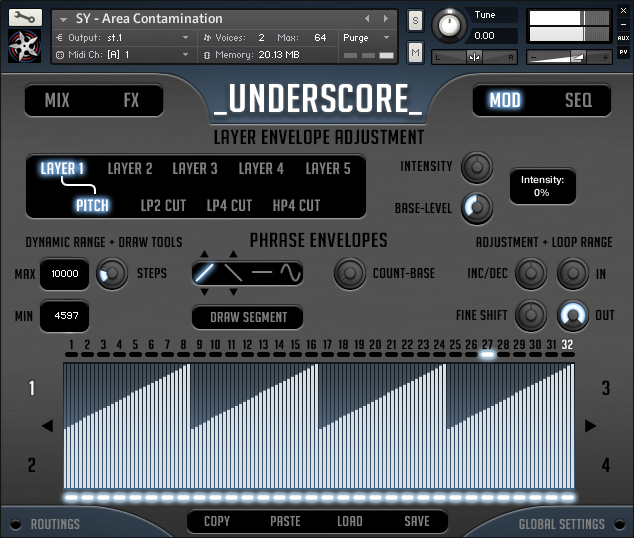 Each of the 200+ patches in Underscore consists of up to 5 independent modulating layers, creating detailed and dynamic sounds which respond expressively. Each layer has its own LP/HP filters with independent volume and filter envelopes and also parameter randomization (volume, pan, pitch, sample start, start delay). 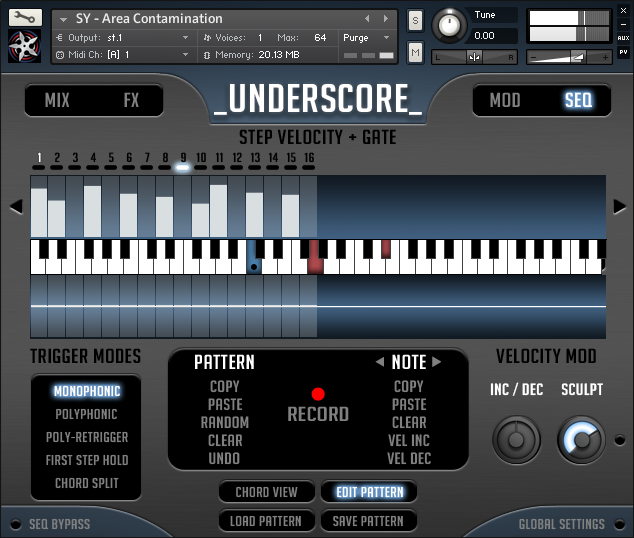 All layers also have a user-programmable velocity response curve which can yield completely new and unique tonal possibilities with the swipe of a mouse! You can also perform cross-fades between each layer to create anything from simple fades to big evolving textures. 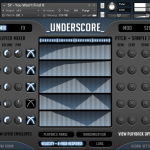 Each patch in Underscore also has 4 Phrase Envelopes available and can perform a wide array of sonically interesting manipulations over the length of a phrase. Each Phrase Envelope is independently assignable to 58 simultaneous instrument parameters including filters, volume, pan, pitch, and the Layer X-Fader. Phrase Envelopes they can perform long sweeps over several bars while the sequenced pattern is looping underneath, or work to add subtle human pitch fluctuation to a single layer. Draw your own shape freehand, use one of the many included presets, or better yet, use the comprehensive drawing tools to dial in exactly the nuance you want. The FluidPhrase Engine is the foundation of Underscore, and represents the most innovative feature in the product. It’s a 60-voice polyphonic sequencer (up to 32 steps) with variable length and count-base which locks to host tempo and is triggered in real-time from a MIDI keyboard or host DAW with 12 preset patterns available via key-switches. The FPE has 5 play modes (Monophonic, Polyphonic, Poly-Retrigger, First Step Hold, and Chord Split) which lets you improvise complex rhythms with ease, inviting you to explore endless variation. A simple chord can become a motif; a broken chord can transform into a hypnotically polyrhythmic ostinato pattern. 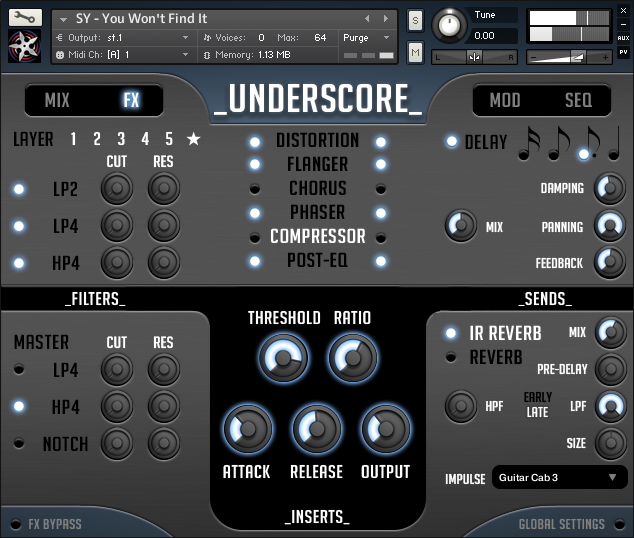 Underscore offers 5 unique trigger modes, which yields an astonishing array of rhythmic possibilities. 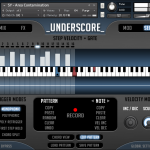 Monophonic is great for single note lines, while Polyphonic mode triggers a chord with all notes in sync. Chord Split is great for splitting an input chord into an arpeggio with programmable note order, and First Step Hold polyphonically plays only the first step of the pattern until released – a very useful chord memory feature! Poly-Retrigger is arguably the most powerful mode of all, as it lets you retrigger the phrase from the start of each new note you play. Turn a monophonic pattern into a complex rhythm, or improvise a melody while you hold a note to provide the groove. Up to 12 patterns per patch can be stored and recalled instantly from key-switches. So what would I use Underscore for? 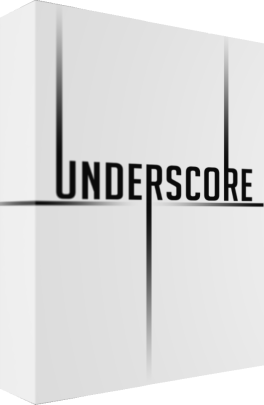 Underscore is designed to meet the needs of modern working composers, who are often asked to write and deliver a LOT of music in a short amount of time. It’s perfect for TV, film and video games composers who want to “fill in the gaps” in scenes without using percussion. It’s also excellent for writing ambient music, creating a big “wall of sound”, writing electronic music, sound design and much more. 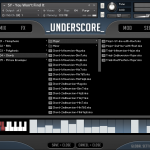 Use Underscore for sci-fi, retro, steam punk tracks, ambient music, electronic music, adding sonic candy or sparkle to your tracks, adding big or small layered sound, sound design and more. It’s the ultimate tool! Normally €230.99 – get it at 91% off before it’s gone! Absolute no-brainer at 91% off the normal price (normally €230.99 and now only €19.99!)! 5 distinct trigger modes: Monophonic, Polyphonic, Poly-Retrigger, First Step Hold, or Chord-Split.